Central Silk Board, Ministry of Textiles, Government of India has given a notification for the recruitment of director, Joint Director and Assistant Director vacancies. Candidates who are eligible can apply in the prescribed format from 28 June 2017 to 7th August 2017 for remote areas. Age limit : Candidates should be below 53 years of age. For Director, while the age for Joint Director not exceeding 50 years of age, while for Assistant Director the age must not exceed 35 years. Candidates should posses a doctorate degree in Entomology, Zoology, Agriculture, Botany or Sericulture or an equivalent qualification for the post of Director. Candidate should posses MBA for post of Joint Director, while they should posses Chartered Accountancy with preliminary Examination I from ICAI for the post of Assistant Director. Pay Matrix Level-12 as per VII CPC recommendations i.e. Rs.78800-209200. Selection Process: Candidates will be selected on the basis of written test and interview. Applications together with photocopies of educational qualifications, age, experience, Disability Certificate in respect of Persons with Disabilities (Certificate issued by Medical Board) and Caste Certificate in the case of SC/ST/OBC etc., should reach the Member Secretary, Central Silk Board, ‘CSB Complex’, Hosur Road, BTM Layout, Madiwala, Bangalore – 560 068 within the stipulated date in the prescribed format. 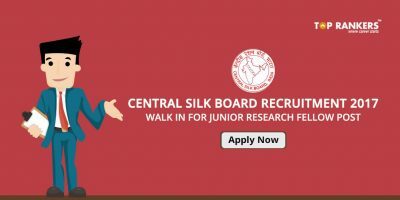 Stay tuned for more updates on Central Silk Board Recruitment 2017!